I grew up on the Devon coast, the beach was my playground. I am drawn to making pots which remind me of lazy summer days next to the ocean- textures and colours of my favourites; Bantham, Bigbury, Challaborough all have put their mark on my work. My pottery is designed to transport people to their favourite beach or stretch of coastline. My training as a painter before I became a potter means I work backwards, I think about the colours/ textures I want to use first, before I think about form a pot will take. I suspect most potters think about the form first. There is something about working in 3D that painting on a canvas could never afford me. As a painter I was always very inspired by Georgia O’Keeffe, I also see her colour pallet reflected back at me in my pottery. I name each design after a specific moment I've had at the coast; Stormy Seas Dinner Plate, Calm Seas Bowl, Frosty Blue-Green Mug, Sandy Bay Jug. 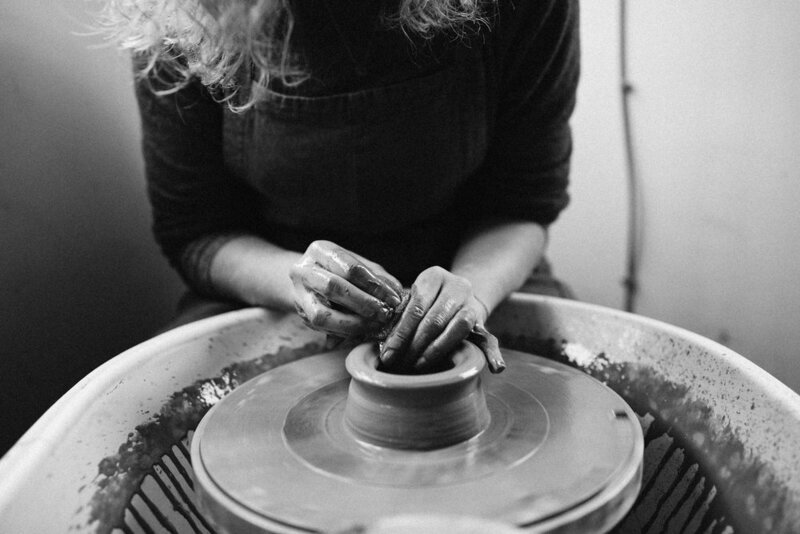 Each individual pot is lovingly crafted to have it's own unique characteristics and personality, no two pieces are exactly alike - I want each one of my pieces to feel like they have soul. I go to the coast regularly to recharge and gather inspiration. I design and hand-make everything from my studio, just outside of Bath, Somerset. I mainly make tableware, mugs, teapots, teaspoons and kitchenware but I also make larger art pieces. I make everything myself on the potter's wheel in stoneware clay, hand glazed and high fired up to 1200 degrees centigrade (or beyond) The whole making process can take 2 - 6 weeks to complete. My work is refined yet still has a rustic charm. I throw my pots finely yet each piece still has the robust feel of handmade; handles are 'grip-able', plates can withstand everyday use. I’d like to think my work offers a more mindful eating and drinking experience. Drinking from a handmade mug is a very different experience to drinking from a mass manufactured mug. Think of me (the maker) whilst choosing a cup from the cupboard, enjoy the feel of the form beneath your fingertips and study the colours and textures of the glaze whilst waiting for your tea to brew. Feeling the love and care that went into the piece, taking time to ground yourself in this object which was born of earth, water and fire.